One of the Easiest Orchids to Grow! Add a fairy-like touch to your garden with this colorful mixture of white, light pink and blue-purple. The small, lilylike flowers, 3 to 7 per stem, rise above the pleated, sword-shaped foliage. 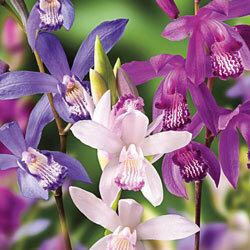 These beauties will add a magical touch to partially shaded borders or rock gardens. Foliage Type: 3-5 linear, pleated, papery-textured, sword-shaped, pale green leaves to 12" long. Flower Form: Small, cattleya-like, flowers to 1.5" long in 3-7 flowered racemes atop naked scapes typically rising to 20" tall. 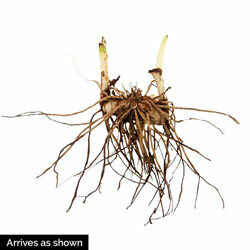 Planting Instructions: Plant corm-like pseudobulbs to 4" deep in spring. Soil Requirements: Organically-rich, medium-moisture, well-drained soil. Winter Care: No winter care neeeded.